With the ESV Study Bible, Crossway’s team loaded a remarkable amount of additional resources and materials alongside the biblical text. The purpose of the added material, of course, is to enhance the understanding of the text and its background. With the ESV Readers Bible, they move in the opposite direction, seeking to remove all extraneous information and markings with a complementary goal of making the text as reader-friendly as possible. 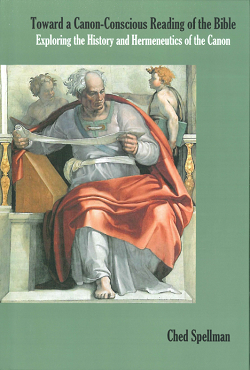 There are several features of this “reader’s Bible” that are designed to enhance a reader’s experience with the biblical text (sometimes called “paratextual features”). The function of these features stems not from how the editors supplement the text but rather how they showcase the text. The central feature of this edition can best be seen in what cannot be seen on each page. Well-established and long-running trends in Bible production fill the margins, footers, and headers with as much information as possible. The medieval version of this type of supplement is represented by the familiar system of chapter and verse divisions. These features have been omitted from this edition, so that for the most part, a reader encounters the biblical text without breaking points. The text is presented in a single column in the center of the page surrounded on each side by generous margins. There are page numbers at the bottom of the page and an index in each volume that lists the location of the original chapters. This streamlined feature is particularly helpful when reading narrative, as the stopping points are organic to the story or account itself. You simply stop reading where the story ends. Shifts in genre are also more prominent. One of the calling cards of biblical books is the blend of literary genres. Because the editors still mark out poetic texts with unique margins and spacing, a reader is able to see clearly where narrative ends and poetry begins. Even in non-narrative texts, this feature can introduce fresh readings of familiar passages. For example, one of the unique aspects of the letter to the Hebrews is its repeated shifts from exposition to exhortation. When reading the letter through without chapter breaks, I perceived several textual connections between sections that I had previously neglected. This experience allowed me to recognize the implicit hermeneutical significance I typically attribute to verse and chapter divisions. Because the pages are thicker and the margins are wider, there are six volumes to accommodate the amount of textual material. While a foreign concept to most contemporary Bible readers, this scenario echoes a significant time in the Bible’s history when biblical books were gathered and circulated in groupings. Thus, this reader’s edition can function not only as a novelty item but also a teaching opportunity. For instance, the series of six volumes visibly and strikingly communicates the textual real estate that belongs to the Old Testament. 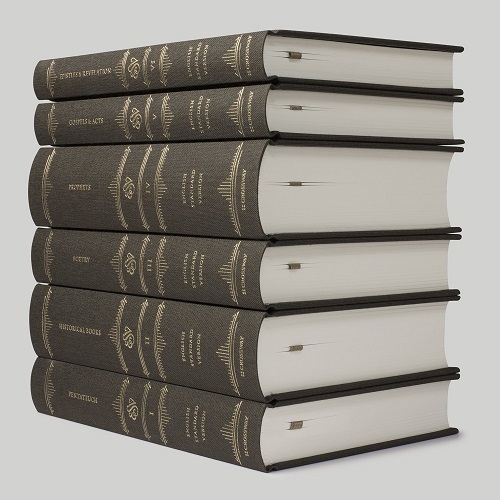 The looming volumes of the Pentateuch (507 pp), the Historical Books (690 pp), the Prophets (768 pp), and the Poetic books (504 pp) stand out against the two slender volumes of the Gospels and Acts (365 pp), and the Epistles and Revelation (336 pp). Using this Bible regularly could subtly influence a reader to reckon with the foundational and textual importance of the Old Testament when thinking about the Bible as a whole. Utilizing an edition like this also allows you to conceive how the concept of “canon” could function before the invention of a codex large enough to contain the entire collection. Being able to take a grouping into your hands also allows a reader to consider the importance of biblical theology and canonical interpretation. One immediately notices how much narrative is in the Bible. When readers make a selection, they also hold in their hands a discrete grouping or a collection of biblical books. These two physical actions can remind readers of the interconnectedness of these two concepts: the big picture of the Bible’s grand storyline is rooted in the shape of the gathered canonical sub-collections. 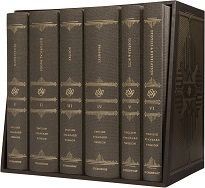 Here we see diversity (several volumes) in light of a canonical unity (within a single conceptual and physical edition). Another significant feature of this edition is the absence of any cross-references or text-critical notes (the front matter directs readers to ESV.org for this information). One might think that because of the vast amount of information available to us as readers, we are in a better position to know how our Bible fits together. However, oftentimes instant search capabilities or the ubiquitous presence of cross-references can actually short-circuit the organic mental steps necessary to identify, conceptually locate, and hermeneutically account for the presence of an intertextual connection. Editions like the ESV Reader’s Bible can help us recover the art of intertextual discernment and begin training those mental muscles that the age of new media has atrophied. One disappointing aspect of this edition for me is the presence of editorial headings. Though most modern versions of the Bible include extrabiblical headings that summarize sections and provide helpful signposts in the text, the reader’s edition was meant to allow the text itself to occupy center stage. The presence of a heading breaks the flow of any text and involves an interpretive move. Accordingly, the presence of a heading influences the reading and interpretation of a literary work. One might respond that there are only a limited number of these headings and they are intended to summarize the content. While true, this response misses the subtle ways that paratextual elements influence a reader’s perception of the meaning of a text. Also, because the editors only place a limited number of headings in a particular book, this actually gives them a much more prominent role in the flow of each volume. I say missed opportunity because the goal of the reader’s edition is to allow the text to demonstrate its own structural framework. The heading at Isaiah 40, for instance, signals something that the text itself could have done. There is a discernable shift from a prophetic message of judgment to one of salvation. However, the shape of Isaiah itself communicates this, as there is a clear literary shift from a narrative form to a poetic one, and the opening sequence of this new major section of the book is, “Comfort, comfort!” Thus, the editors perhaps missed an opportunity to allow their wonderful idea to have its fullest effect. The strategic function of a narrative account in Isa 46-49 is also introduced by the unartful heading, “A Historical Vignette.” I actually agree with the decision to provide “sense divisions” that include extra spacing between large sections of texts and a raised initial letter of the first word. Perhaps utilizing this more subtle discourse marker would have assisted readers making their way through large swaths of text but also allowed the flow of the discourse to create cohesion between sections. This very minor disappointment is not really a criticism but rather a talking point prompted by the stellar design concept of the ESV Reader’s Bible. The cost of this special edition is significant, but it would make an excellent gift or a worthwhile investment. The enduring value of any publication of the Bible is its ability to help readers focus on the biblical text itself. This beautiful edition is uniquely equipped to leave the reader be and let the reader read! Also in Themelios 42.2 (August 2017): 407-10.